Do you think and act globally in your local community? Years ago, I caught on to the practice of fair trade. Knowing deep down free trade is not fair for many global citizens, I looked for a different way to do business. 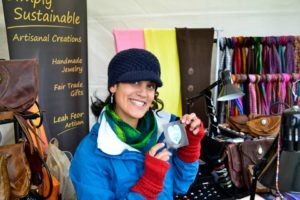 It was through the fair trade movement that I was able to breathe new life into Simply Sustainable, and connect with communities near and far. Back in 2010 when I was making a major shift, I invested in a small batch of handicrafts from a neighbouring community in Guatemala, where I was living at the time. I packed a duffle bag full of goodies, and set forth for the North where I would exhibit them alongside my handmade jewelry at fairs and festivals during summer months. For me, it was not only a way to subsidize my pay and fill my 10×10, it was a way to spread a message. This message was one of hope, but also one of great injustices. We live in a world plagued with inequality, and I couldn’t keep my mouth shut any longer. Nobody likes a preacher, so I would turn potential customers off with my intensity. Despite my background in commerce – and knowing full well this approach was bad for business – I didn’t care. It’s not that I was trying to turn people off, or scare them away – it’s just that I couldn’t let the message go unheard. Well, there are many. But today we are going to focus on a message about access to opportunity. I’ve heard criticism before that people choose to be in poverty. Nothing can be further from the truth. Sure, there are people out there that are lazy. But I bet you that nine times out of ten – given the right opportunity – they’d rather be productive and contributing to their community. While I don’t have all of the answers, I believe it has a lot of do with passion and purpose. It’s a lot easier to work hard at something worthwhile. What happens when meaningful work does not exist? That brings me to today’s topic. Sustainable Development Goal 10. Isn’t that what fair trade is all about? We have the capacity to look beyond our borders, and extend opportunities across the globe to mobilize solutions. So while many might blame offshore outsourcing of goods and services for the lack of employment at home, I urge you to take a broader look at the issue. Outsourcing employment overseas does not need to be unethical or unjust, for anyone. It can open up the door to so many opportunities. An organization can be built with a team from anywhere in this world. As I shift from selling goods to offering services, I recently learned about virtual assistants from communities near and far. Meeting with a social media guru she shares stories about the wonderful graphic designer she works with from Colombia. Then she lights up when she talks about a novice assistant Brent out of the Philippines who is eager to work with sole proprietors, giving them a hand with their admin tasks. He went on to explain that by being a virtual assistant he was not only presented with the opportunity for a better wage, he was also granted the opportunity to work from home. This of course reduced the dependence on commuting to a big city, taking time away from his family. The light bulb went off. If we can have fair trade for coffee and chocolate, why can’t we have it for services too? While I find it important to stimulate jobs locally, it’s my nature to extend those opportunities globally. After all, with a long list of goals and targets for a sustainable future that need to be achieved, we’ve got a lot of work to do! Why wouldn’t we take a chance, and give ethical globalization the opportunity? I’d love to hear what you think about this topic & learn about initiatives in your community. Please feel free to comment below or on Twitter. Leah Feor is the owner of Simply Sustainable, a small business that has evolved from a fair trade mobile shop to a strategic consulting firm serving entrepreneurs with a social or environmental vision. Balancing her clients’ Triple Bottom Line – people, planet, profit – is Leah’s utmost goal, and is supported by her background in accounting and environmental management. All text and images posted on the Simply Sustainable Blog are property of Simply Sustainable. Any material referenced as quotes must be cited. The content of this blog cannot be reproduced without written permission by the owner. Please contact simplysustainableblog(at)gmail(dot)com with any questions or requests.